What are the asylum seekers fleeing from? When the knowledge that migrant and asylum-seeking children were being separated from their parents at the U.S.-Mexico border was made public, it made headlines for days. Most North American media focused on the abusive treatment towards these children by the U.S. Immigration and Customs Enforcement (ICE) agency, but little attention has been paid to what these people are fleeing from. While it’s not on the same level as what’s happening in Syria, the situation in Central America is nearly as violent. The primary source of refugees and asylum seekers to the U.S. have been from the “Northern Triangle” of Honduras, Guatemala and El Salvador. All of these countries are dangerous to live in—according to the UN Office on Drugs and Crime, Honduras and El Salvador were two of the deadliest countries in the world, with 56 and 82 homicides per 100,000 inhabitants, respectively. As written in U.S. State Department reports from March 2017, these countries have massive security problems. The average citizens there face moderate to extreme poverty, and the only way for most to escape it is to either leave the country or join a gang. These gangs will then groom children, and eventually give them the choice of joining them or dying. Honduras in particular can barely afford to pay its public school teachers, and constant strikes leave many classes cancelled, resulting in even more children being recruited by gangs. UNESCO found that, in 2016, only 31 per cent of Hondurans completed high school. Homicide rates are also extremely high due to lack of effective deterrents. Police are generally either corrupt or too overencumbered to act, and in 2014 it was estimated that only five per cent of crimes in Honduras would be investigated. These nations are caught in a spiral of poverty and violence. At this point, anyone with a modicum of empathy should want to address the underlying problem bringing families to the United States for asylum. People will continue to flood towards the border to escape, as getting stuck in a large cage may not prove as terrifying as the possibility of being murdered by a gang member. Few foreign investors have any interest in investing in these countries, and you can imagine why. Who would spend $1 million on a factory only for it to either go up in flames, get seized by the military and nationalized, or be left completely abandoned by the populace? In Guatemala, for instance, low enforcement of intellectual property rights means that starting factories of any sort isn’t appealing. These countries can not be considered politically stable. 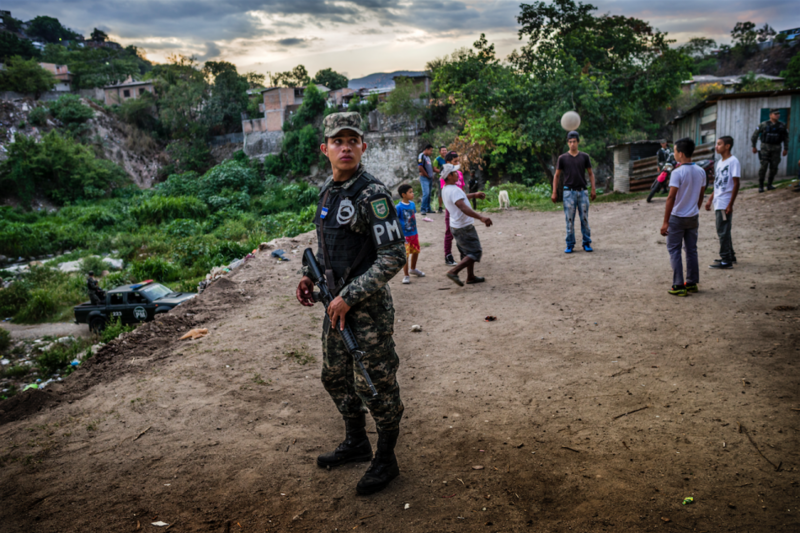 Guatemala is still dealing with the aftermath of a civil war that lasted from 1960 to 1996. Honduras had a military coup in 2009. Protests in Nicaragua that started in April are still ongoing, with an estimated 285 already killed in the ensuing violence. While Venezuela and Colombia still have their share of problems, Colombia has done a fairly decent job at curbing its crime rates, posting a murder rate of 24 per 100,000 in 2016, the lowest since 1974. Much of this can be attributed to political reforms, clever urban planning, and assistance from the U.S. Medellin. The former headquarters of Pablo Escobar’s famous drug cartel is in fact safer than many big cities in the U.S.
It’s currently estimated that 90 per cent of cocaine in the U.S. is routed through Honduras. The lack of reliable law enforcement there is likely appealing to traffickers. Cracking down on gangs in the Northern Triangle is made more difficult by the fact that most gangs lack coherent structure and act independently of one another. All of this information shows that many of the people running from Central America to the U.S. are asylum seekers, not “economic migrants,” which the country formally recognizes the right to be. Despite what President Trump suggests, there’s nothing illegal about showing up at the U.S. border and asking for help. The U.S. has slowly become more and more inconsistent with accepting claims from these asylum seekers, and it can’t be attributed to who’s in the White House. In President Bush Junior’s second term, 50 per cent of Venezuelan asylum seekers, about 2,000 of them, were granted status, while only 700 Iraqi refugees were accepted in a similar time period. While sovereign countries ultimately have the legal right to decide who’s allowed in their borders, acceptance of refugees is both moral and beneficial to host countries if done correctly.